Zombies have saturated pop culture since Night of the Living Dead premiered in 1968. The big, and small screen, has been filled with variants of the mindless, bloodthirsty, and decomposing undead, but culture has always made us root for the slaughter and eradication of the infected. iZombie effectively flips that script: Its characters aren’t just mindless, brain-eating, monsters—they’re also victims coping with trauma. After Olivia Moore (Rose McIver) is scratched by a drug-fuelled zombie at a boat party, she starts to exhibit symptoms similar to post-traumatic stress disorder (PTSD). Her skin becomes pale white; she withdraws from close relationships; and she gives up her career to work in isolation as an assistant medical examiner. Liv even has flashbacks caused by unpredictable triggers. But becoming a zombie doesn’t mark the end of her life, as it does in the Walking Dead or 28 Days Later. In those narratives, it’s better to die than be turned, but iZombie begins with the trauma of zombie transformation. Liv can only find balance by eating brains, which satisfies her hunger, regulates her mood, and keeps her from degenerating into a romero—a shambling, decomposing zombie. Eating brains also gives her abilities, including experiencing the dead person’s memories and emotions. For instance, Liv eats the brain of an eternally optimistic coffee shop owner so she can counteract despair with positivity and happiness. She uses the muscle memory of a painter to express her own feelings through art. There are even times where she overindulges, diving into the brains of victims that come across her morgue table as a means of escaping difficulties in her life. In this way, her diet acts as an anxiety medication or antidepressant. While it seems unnatural to her at first, it’s what she needs to cope with the trauma of being turned. PTSD is often framed as a military-related mental illness, which forgets the victims of assault and abuse. In iZombie, Fillmore-Graves, a private military corporation entirely composed of zombies, shows how an entire community facing trauma can come together to support each other. They even produce brain tubes (think Gogurt except with mashed brains) to feed their masses. But the show centers the victims who don’t have a community to share their trauma with and don’t have access to the same resources. Liv was a victim of a careless mistake, so she chooses to accept the changes to her body. However, many zombies reject the transformation. When the trauma is deliberate, zombies try to blend in, hiding behind spray tan and hair dye, and denying that anything happened to them at all. Instead of finding a community of support, they internalize their own trauma until it can’t be dealt with any longer. 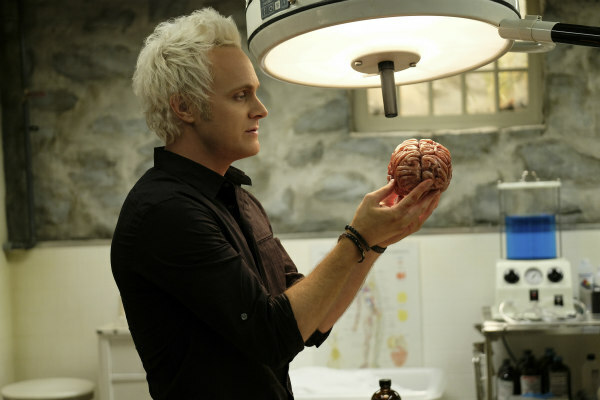 The majority of the show’s zombies were violently turned by Blaine DeBeers (David Anders), the city’s only brain dealer who creates a demand by kidnapping and killing homeless teens for their brains. Blaine even turns Seattle police department lieutenant Suzuki (Hiro Kanagawa) so he can keep his operation protected from police interference. Blaine turns him without consent leading Suzuki to end his own life in an effort to cover up the existence of zombies, but also to escape his fate living as one himself. Suzuki didn’t see himself as a victim, but he did see himself as a monster. Blaine used to be a victim: He was physically and emotionally abused by his father, which made him feel inadequate, small, and weak. When he’s infected at the same boat party as Liv, he begins perpetuating the cycle of abuse over again. Blaine uses his desire to both defeat and impress his father and excuse away his abuse, a narrative we see about destructive white men over and over again. The actions of white mass shooters, domestic abusers, and serial killers is supposedly justified by the years of bullying or abuse they’ve endured. They are labeled mentally ill and deemed misunderstood victims of their circumstances. White men use abuse as an excuse for violence, but women are often forced to handle trauma on their own—and help heal others in the process. Sebastian (Matthew MacCaull) accidentally turns himself after tasting a drop of Liv’s blood, but he blames her for transforming him and making him kill and eat his aunt. “Funny. I’ve never eaten anyone I didn’t want to eat,” Liv retorts. And it’s true: Although she struggles with her hunger because she hasn’t overcome her trauma, she actively participates in harm reduction. She becomes a medical assistant so she can gain access to dead people’s brains rather than killing living people. Even though she occasionally loses control, she still manages to reign in her appetite. Liv is constantly aware and adapting to how her new state affects those around her, but men like Blaine and Sebastian use it as an excuse to act on their own pain. They don’t mind playing into the zombie stereotypes to justify their own actions without any kind of accountability. In iZombie, humans don’t know that zombies walk among them because the community isn’t sure how the world will respond. Zombies are stigmatized in pop culture, so they are forced to deal with their new state almost completely on their own—much in the same way PTSD is highly stigmatized. Identifying with the disease can lead to the stigma of being labeled “unbalanced,” so some people never seek help. They don’t want to be considered dangerous just because of a diagnosis. This is something we see with Liv. She would still be depressed, avoiding family and friends, if Ravi (Rahul Kohli) hadn’t discovered her feasting on brains on a morgue table. Ravi’s initial interest stems from a scientific curiosity, but he and Liv eventually become friends: He keeps her secret and offers her support, one the of only things we can do for those who’ve experienced trauma. Ravi’s support is key to Liv’s survival. When Rachel Greenblatt (Ella Cannon), a reporter for the fictional Alt-Weekly newspaper, discovers that zombies exist, she decides to out them, putting the entire zombie population at risk. The difference between how Ravi and Rachel react underlines the importance of being an ally to a trauma victim. While Ravi tried to understand and keep Liv’s secret, Rachel uses the information to incite fear and gain publicity. 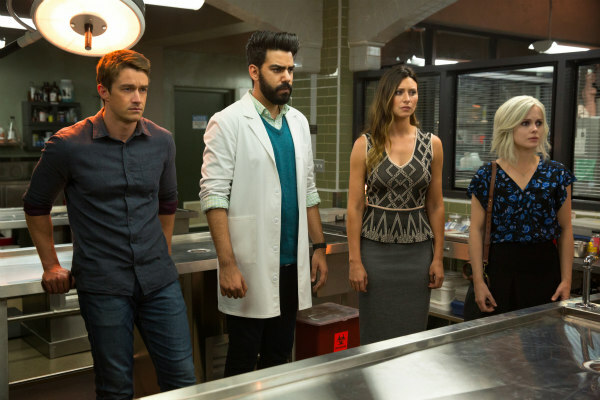 iZombie teaches us how to show up for the trauma survivors: In the same way that Fillmore-Graves begins providing free brains to Seattle’s zombie population, we need to support victims rather than approaching them with fear. We need to stop the narrative that victims can’t be helped if we actually want them to survive. We can’t starve victims and then blame them for trying to feed, just like we can’t dismiss the actions of those with full bellies. We need to stop viewing people with PTSD as romeros, and start feeding them with compassion and support. Instead of promoting a culture of shooting on sight, iZombie tells us to treat each victim with nuance, with consideration, and with understanding. It tells us to humanize them, not demonize them. As it moves into its fourth season, iZombie can show us tangible and meaningful ways to support trauma survivors—especially the ones in our lives. Mari Ramsawakh is a disabled genderfluid writer. 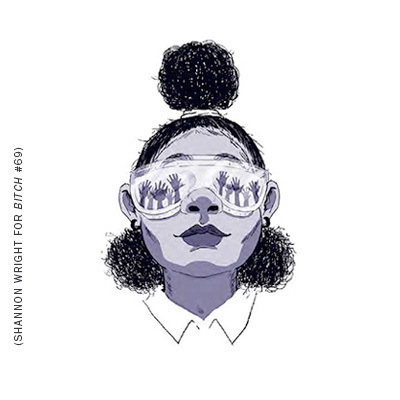 They write about disability justice, mental health, racial inequality, and queer rights. Relevant: Let's Talk About the Women of "The Walking Dead"